Police are currently looking for the origin of these drugs, after learning about the discovery at 8am on Tuesday. 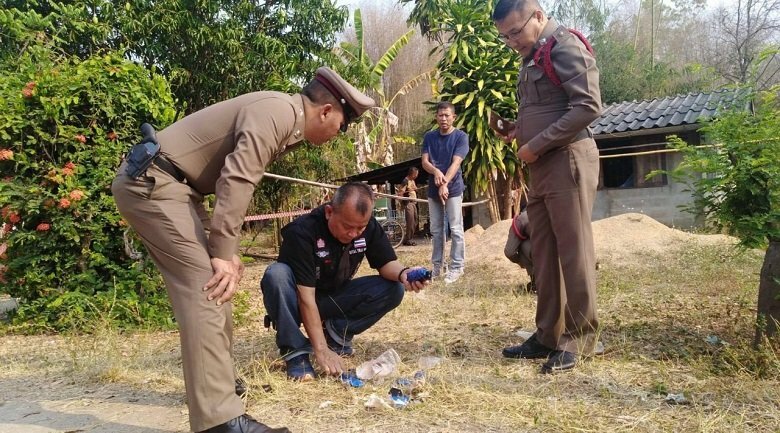 Mae Tha deputy superintendent Pol Lt-Colonel Nawin Sitthithianchai led the investigation team to the site, where they found bitten plastic bags, containing orange-coloured bills. The dog’s owner, Namthip Wongsa-art, 37, said she had no idea where her one-year-old pet, Toon, had found the drugs. Kalaya Pukhrae, 48, who was the first to see the drugs, told police that she thought the dog was playing with garbage, but on closer inspection, she found they were pills, so she alerted a community leader who called the police. Investigators suspect the haul might belong to a drug-trafficking gang, which had left the cargo in a wooded area for someone to pick up, but the dog probably found it first and brought it home. Perhaps it was used to the smell from home. is this dog for sale? The birth of a portal in space-time continuum: A Thai dog accidentally ate 1000 yaba pills and started chasing it's tail. Ya bark. Popular with cannines, apparently.